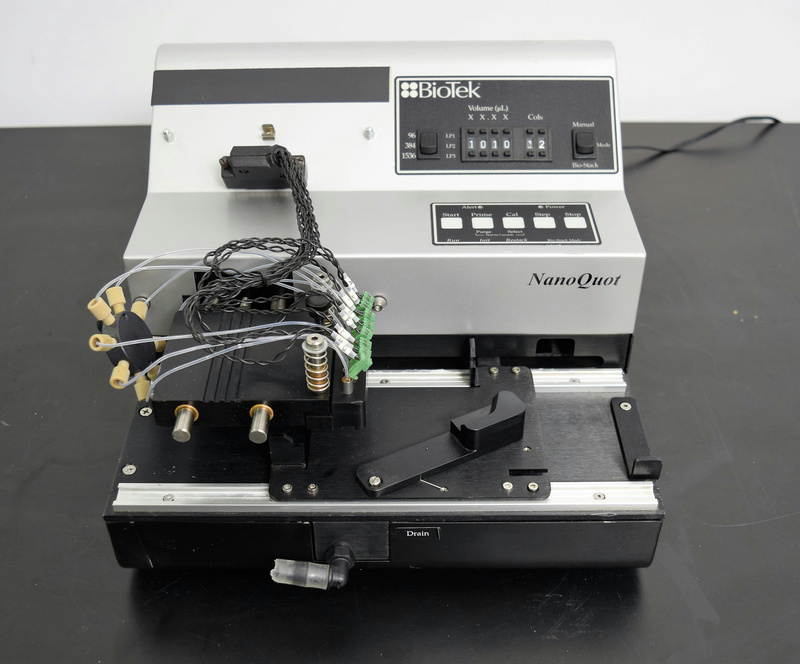 Biotek NanoQuot Microplate Dispenser Liquid Handler Nanoliter Analytical . New Life Scientific, Inc.
* Functionality: Tested as far as the mobility of the unit. * Condition: Cosmetically the dispenser is in good condition. The NanoQuot is an effective and low cost plate dispenser. Features an RS port for computer communication. Our on-site New Life Scientific technicians were able to test fluidity of the plate movements. The device initialized and functioned great without any issues. The Biotek NanoQuot is an economical, universal microplate dispenser. Its dispense head contains 8 channels that can accurately dispense volumes as low as 100 nanoliters into 96-well, 384-well, and 1536-well microplates. Its throughput increases with the addition of a BioStack microplate stacker and an RS port for computer-defined automation. Servicing is easy with its pre-defined Purge and Prime operations in addition to holding 2 mL of dead volume, making the NanoQuot an effective yet low-maintenance plate dispenser.